UND President Mark Kennedy (left) congratulates UND alumnus Matt Dunlevy, president and CEO of SkySkopes, on the growing success of his company. SkySkopes is the first FAA approved and fully insured UAS business in North Dakota. Photo courtesy of Matt Dunlevy. University of North Dakota President Mark Kennedy stresses that he’s a pro-oil-and-soil guy. But, Kennedy also says, when it comes to diversifying the state’s economy away from wide swings in oil and wheat prices, the future lies elsewhere with industries in which UND already has a strong foothold. “UND had a bit of a hand in helping to spark the last oil boom, and we’re as likely to be the ones to help spark the next as any because of our research on extracting that energy at a lower cost with less environmental impact,” Kennedy told a gathering of UND alumni and friends in Bismarck on Tuesday. 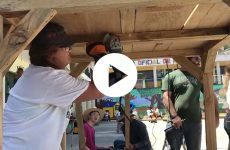 “But if you’re really going to think broadly about what a university does for a state, particularly a state that has become overly dependent on oil and soil, we need universities like the University of North Dakota to diversify the economy. 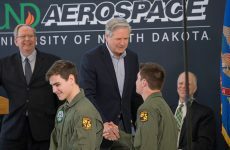 Kennedy pointed squarely to opportunities that exist in North Dakota because of the pioneering efforts in unmanned aircraft systems (UAS) at UND. Kennedy said more — not less — investment in this surging area of technology makes sense for North Dakota, especially in a down economy. UND President Mark Kennedy addresses a gathering at the 10th Annual UAS Summit & Expo, held in August 2016 in Grand Forks. Kennedy believes UAS research and innovation, the likes of which is taking place at UND, could be key in helping North Dakota diversify its economy. Photo by Jackie Lorentz. Tom Ford, head of the local Base Realignment Impact Committee, says that UND’s aviation legacy already has had a major economic impact on the region and state. When the Grand Forks Air Force Base lost its KC-135 tanker mission in 2005, there was fear that Grand Forks eventually would lose the entire base, which in its prime had a $600 million annual impact on the economy, Ford said. Within one year of the lost tanker mission, a new focus arose at the base: drones. About the same time, UND was named as a U.S. Department of Defense Center of Excellence for UAV Education, now called the Center for UAS Research, Education and Training. 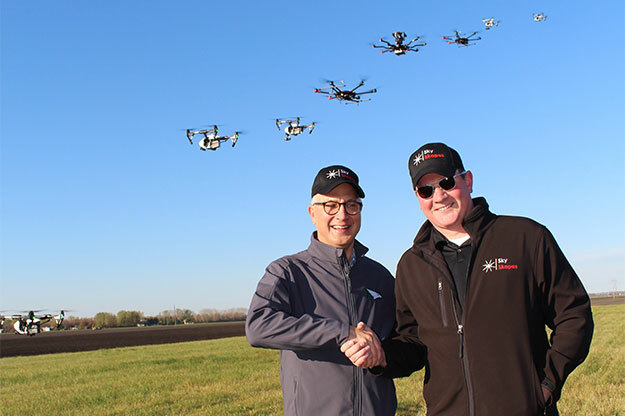 When Matt Dunlevy was looking to start a new business a few years back, the UND alumnus saw a major opportunity in the UAS industry because of the support he found around UND and in North Dakota. Today he’s president and CEO of Grand Forks-based SkySkopes, a UAS service company that specializes in aerial inspections. “One of the reasons we’re able to thrive is being able to rely on the education our UAS pilots are getting from UND,” Dunlevy said. And as Dunlevy proves, diversifying an economy with unmanned technology doesn’t mean oil and soil aren’t still part of the equation. Business has been so good for his UND spinoff that he recently opened an office in Minot, N.D., near the oil-rich Bakken Formation of western North Dakota. 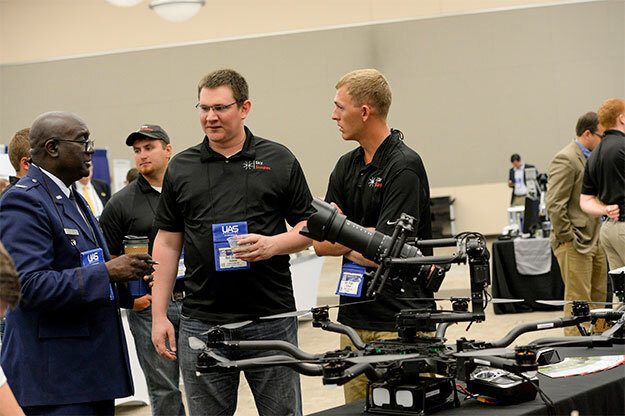 Dunlevy (center), and Cory Vinger (right) talk with U.S. Air Force Col. Paul Young (left) from Lackland (Texas) Air Force Base, at the 10th Annual UAS Summit & Expo held in August in Grand Forks. Photo by Jackie Lorentz. Dunlevy’s company also is involved in precision agriculture, which is another breakthrough market for UAS growth in North Dakota. SkySkopes also is busy working with the utility industry, inspecting power lines in a collaboration with Israel-based Elbit Systems and Excel Energy. The project was a good fit for Elbit Systems, which had been looking at the commercial possibilities for its Hermes 450 UAS platform. That opportunity evolved out of Research ND, a state program connecting businesses with university researchers. 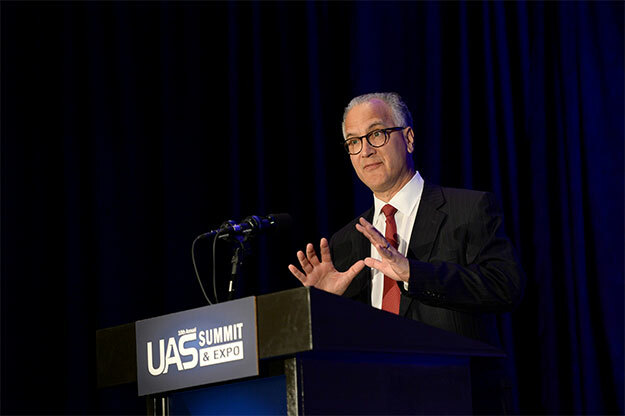 UND and UND-affiliated UAS entities also are collaborating with industry giants such as Northrop Grumman and General Atomics in the new Grand Sky UAS Business and Aviation Park. Located adjacent to the Grand Forks Air Force Base, the park is a first of its kind in the United States. President Kennedy said the UAS industry is built around collecting data. And with each terabyte collected, there is a need to store, secure and process it into actionable information that clients can use. However, many UAS companies doing business in North Dakota send that data to places like Boston, Austin, Texas, and Palo Alto, Calif., for analyzing. That’s a trend that needs to be reversed, Kennedy said. “We want them to be keeping it right here in North Dakota,” Kennedy said. According to UND computer scientist Travis Desell, that’s where the gold is — and the jobs. 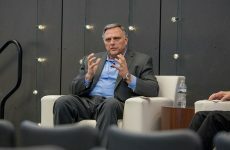 With so much raw data being collected in the state through UAS, he said there would be a massive demand for data scientists in North Dakota.